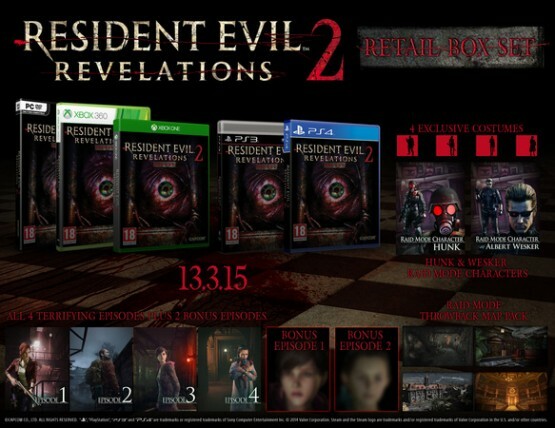 In addition to confirming that Barry Burton will be playable, Capcom revealed the many release dates of Resident Evil Revelations 2 today for PlayStation 4, PlayStation 3, Xbox One, Xbox 360, and PC. Looking at Barry, he’s headed to the remote prison island in search of his missing daughter, Moira Burton. Meeting up with new character Natalia Korda, who is described as “a little girl who has a strange power that allows her to sense enemies and hidden items,” you must alternate between the two to survive. Each episode in Resident Evil Revelations 2 includes Raid mode content and two full playable scenarios focused on the previously announced Claire and Moira campaign and the newly confirmed Barry and Natalia storyline. Barry and Natalia will need to uncover clues as they fight to survive and their journey will lead them to terrifying encounters with two brand new enemies: The Rotten and The Revenant. The Rotten have bones that are visible through their bodies and stop at nothing to hunt down the living, and the horrific Revenant are formed from parts of human beings sewn together. How will you be playing Resident Evil Revelations 2? Each week? Or will you wait until the retail version?